Academic health complexes in South Africa are in crisis due to the lack of both a national governance structure and an integrated funding framework that leave individual health science faculties at the mercy of provincial funding priorities. In the Western Cape 'not a cent' of the provincial equitable share of health care funding was spent on tertiary services  all the money went to primary and district health care, but its academic health complex served an entire nation. 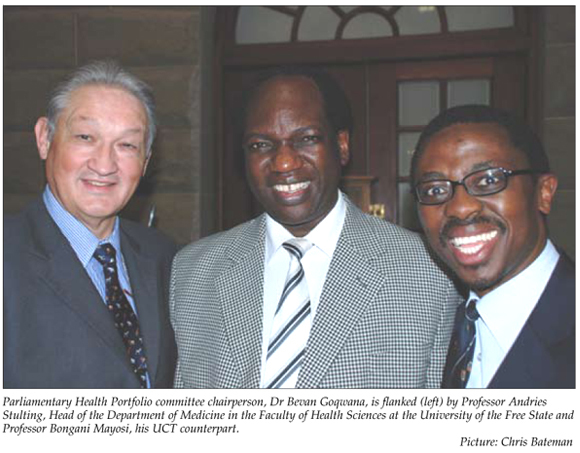 Professor Bongani Mayosi, Head of the Department of Medicine in the Faculty of Health Sciences and Chief Specialist at the University of Cape Town, was among several academic health chiefs giving alarming testimony to the Parliamentary Portfolio Committee on Health on 21 October 2009. Sitting alongside Professor Andries Stulting, his acting counterpart at the now almost terminally under-funded School of Medicine at the University of the Free State, Mayosi said it was 'highly inappropriate' to expect provinces to prioritise what was a national function. He pleaded for government to implement Section 51 of its own National Health Act (2004) which puts Academic Health Complexes (AHCs) squarely under the governance of the national minister of health. The section envisages the minister forming a committee to produce the regulatory framework for governance, funding and planning of academic health complexes. 'The law-makers had the foresight. Yet what we have now is a "mixed masala" of provinces, education departments, local authorities and the national health laboratory services (to name a few), with no governance framework that sets out how the joint mandate is implemented,' Mayosi explained. Academic health complex leaders did not know whom to approach to secure sufficient funds to carry out critical functions that served the nation and the entire region. The situation was having dire consequences in terms of health care worker output, research, quality of tertiary health care and practical training, with the Bloemfontein Academic Health Care complex in imminent danger of collapse. Stulting said a debilitated Pelonomi Hospital (Bloemfontein) was on notice by the Health Professions Council of South Africa (HPCSA) to have its accreditation as a teaching hospital withdrawn unless major problems were resolved. Basics such as running water and medicines were often absent and overcrowding was standard due to a 50% drop in beds in several disciplines since 2008. This meant that its value as a training platform was fast evaporating while fewer and fewer medical students were enrolling at the university. If Pelonomi lost its accreditation, undergraduate medical student numbers would have to be cut by at least 33% next year, intern training posts in the province would decrease by 50 - 75% and no new registrars could be appointed. Of his province he had this to say: 'There's a destruction of the training platform, no coherent plan or policy, inefficient planning and management, lack of resource allocation and R700 million overspending last year; patients and staff are disillusioned.' While there was no money to pay for 'disprins in the pharmacy' the province's new premier spent R11 million celebrating his appointment and more than R1 million on a new Mercedes, he added. Health Portfolio committee chairperson, Dr Bevan Goqwana (a former Eastern Cape Health MEC), said he visited Pelonomi Hospital earlier this year. 'The sixth and seventh floor didn't even have water,' while infection control was dismal, he reported. Mayosi said provinces were taking decisions about AHCs that had dire national implications. Data presented at the hearing backed contentions that by 2012 there would be virtually no-one doing clinical research in SA (the current average age of researchers is over 60 with no youngsters entering the field since 2002). This had serious implications for health care delivery. A Department of Science and Technology panel was due to table findings on the research crisis before the year's end, Mayosi revealed. On tertiary hospital under-funding and under-staffing, Mayosi revealed that at Groote Schuur Hospital there had been a 40% increase in admissions over the last year, but the number of beds was drastically cut. something I'm sure you would not wish on your father or mother,' he added. Surgical lists had been cut, only some equipment was being replaced (using research funds) and there was a decrease in tertiary level beds, resulting in a diminished capacity to train staff. Mayosi said most existing nursing training institutions could not provide professional nurses as required by the 2005 Nursing Act (Bachelor of Nursing for entry level to professional nursing) but the Department of Health insisted on talking about increasing and 'revitalising' nursing colleges. Nursing colleges fell under the department of education and so could not prepare nurses as required by the Act, providing only 2-year nursing diplomas. In a paper presented on behalf of Professor Wynand van der Merwe, chair of the Deans Committee of South African Medical Schools, it emerged that between 2001 and 2007 the number of specialists in the public sector increased by only 4% (from 3 619 in 2001 to 3 765 in 2007). Medical officers in the public sector over the same period increased by 32% (7 261 - 9 588). The number of public sector medical specialists rose from 8.9 per 100 000 population in 2003 to 9.2 per 100 000 population in 2006. This had dropped to 8.7 per 100 000 population currently (international norm is 20) with a target set for 15 for next year. The current national public sector specialist deficit stands at 2 590. Current annual production of medical practitioners between the eight academic health complexes was 1 200 with a doubling of this proposed for the year 2014, while the total faculty annual outputs of specialists stood at 450. Bridging the current gap in specialist requirements over 15 years (assuming no private sector or other demand drivers or changes in current staff exit trends and static population figures) would require a 34% increase in current registrar admissions. Achieving a 15 specialist/100 000 population norm in 15 years would require a 58% increase in registrar admissions. The Van der Merwe report emphasised that bridging the gap would only begin after 'years' of increased intake (assuming an immediate intake increase). Professor MH Moola, Dean of the Faculty of Dentistry at the University of the Western Cape (UWC), said under-funding of specialist training at UWC  which produced twice as many dentists as its nearest rival  meant that 31% of its posts were unfilled. Illustrating provincial funding anomalies, he said UWC received R70 million versus the over R100 million of the University of Pretoria (60% white registrars). UWC trained as many African registrars as Medunsa, UP and Wits combined and more coloured registrars than all the other facilities combined. There was currently one dentist to 1.5 million South Africans and of the 5 430 general dental practitioners, 1 900 were working the UK. Most of South Africa's 302 dental specialists were 'ageing'. With the current national output of 250 dentists annually (plus 30 dental therapists, 50 oral hygienists and 10 specialists), there was 'no ways we can catch up (to meet the demand)'. He pleaded for national water fluoridation 'within five years', saying this would halve dental decay in children under five. However, getting the departments of health and water affairs to talk to one another was all but impossible. DA health spokesperson, Mike Waters, told the committee 'we're now in the eye of the storm and unless something drastic is done, health care will collapse in this country'. Goqwana told Izindaba after the hearing that he would summon the national department of health to his committee to discuss nationalising governance and funding structures for AHCs. It was the first time that health science academics had collectively addressed the Health Portfolio Committee.